New Balance is one of the world's major sports footwear companies, with a huge focus on running. Based in Boston, New Balance has historically been a sponsor for many of the city's historical events, such as the Boston Marathon. It made sense for them to look local when it came to building their fitness app: Good Form Running. Intrepid Pursuits suggested me as the designer on this project, and I was tasked with designing conceptual screens for an instructional guide on proper running technique, using New Balance's brand colors, typography, and visuals. Notably, FitBit was new on the scene when this project kicked off, so part of my mission was also to pitch concepts for incorporating FitBit integration into this fitness app. 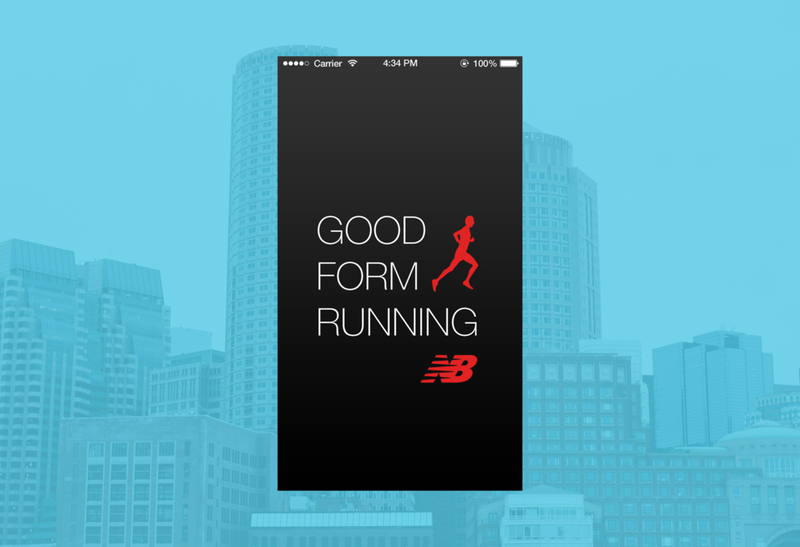 My focus for enhancing New Balance's brand was to bring a clean, but energetic and fun feel to the Good Form Running app. iOS 7 had recently launched, as well, so I also embraced thin, high-contrast lines with bright bursts of brand color for major call to actions. The main design decisions I made on this app had to do with the Good Form Running's main scenario. If all went according to plan, runners with brand loyalty to New Balance would use this app to improve their form while running. To make this app delightful to use while moving at a fast pace, the design had to be stripped down to basics and extremely intuitive. Therefore, I had make sure that call-to-actions were few and obvious, clearly indicate the user's progress through the tutorials, and make sure descriptive text was as unobtrusive as possible through strategic placement. Finally, one of the defining strengths of the New Balance brand is that they have ambassadors like model Heidi Klum (pictured) that demonstrate correct running form through video tutorials. I decided to allow the photography and videos to be the star of the app by keeping the interface minimal, with every button and word having vital significance. This way, users of this app can easily follow along on a relatively small screen while actively running. This was one of my first client-facing projects. It's a different beast than working on your own company's product. Usually, the client you are working directly with represents the company's interests, but has very little experience with design. In this situation, the best approach was to glean what the client's goals are with a product by having a conversation with them. Once you understand a client's goals, it's easier to explain your design choices by framing them with the broad goals in mind. For example, I was able to convince this client to avoid a cluttered screen with too many functions. He wanted the feature set to be obvious to the users, and initially wanted all of the features to be listed on the every screen. After I explained to him that users could have choice-fatigue when overwhelmed by many things, we agreed on main actions for each screen to focus on, with clear links to specific features as they became contextually relevant. Ultimately, we did not win the bid for this project -- another local agency had provided a much lower estimate for their development budget . I was pretty disappointed because I'd put a lot of work into explorations and my final concept, and wanted to continue building the rest of the app and following through on iterations based on how users actually ended up using the posture features. Eventually, I got over it. It was tough to shake off the first time I'd ever experienced an agency bidding war, but I was able to remember that there would be other interesting projects in the pipeline, and part of the uniqueness of agency life is that you're never bored -- things are always changing. In retrospect, designing in a fast-paced environment for so many varied app genres and aesthetics ended up giving me a well-rounded, generalist foundation for my design career.